Perkins’ new generation of diesel engines is an exciting line up that offers many benefits beyond simply helping Original Equipment Manufacturers (OEMs) export their machines to North America and Europe meet the upcoming emission’s legislation of Tier 4 Interim / Stage IIIB. Flexibility, machine integration, dependable power and a lifetime of low costs have been very much at the forefront of the design, development and manufacture of these engines. 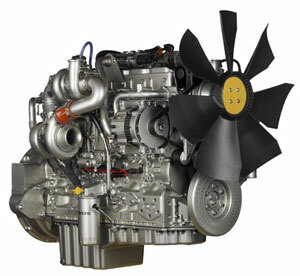 The 1200 Series is a range of four and six cylinder engines that start at 60kW (88 hp) and top out at an impressive 225kW (300 hp), making them the ideal choice to power medium to heavy duty construction applications and mid-horsepower tractors in the agricultural sector. With four engine models to choose from, the 1200 Series provides a variety of options for OEMs who are looking to increase the productivity of their machines while keeping cost of ownership down in the long term. The 850 Series is a compact four cylinder unit that can be truly branded a ‘workhorse’. Two models offer a choice from 45kW (60 hp) to 86kW (115 hp), making them the perfect fit for a host of medium duty applications in the construction, industrial and agricultural fields. With the trend for downsizing machines, the increased power density of the 850 Series allows equipment manufacturers to select this engine where previously they may have used an engine of higher cubic capacity. This frees up valuable space to package the after-treatment unit and significant fuel economy improvements. Last but by no means least, the 400 Series is the epitome of the phrase ‘world engine’. With power spanning 8.2kW (11 hp) up to 49.2kW (66 hp), the 400 Series is suited to most applications. Its two, three and four cylinder line up offers a seamless choice for OEMs in their own model range development. Collectively Perkins’ Tier 4 Interim / Stage IIIB range offers enormous flexibility. The overlap in power ranges means that there is choice at key power nodes, so depending on machine and application criteria, there is an engine that suits the OEM’s requirements. Packaging the engine has been made easier thanks to increased power densities from smaller engines. OEMs can now call upon the required performance levels from more compact units, creating valuable space in the engine bay for the installation of after-treatment and benefiting fuel economy. Machine integration has been at the heart of Perkins’ development programme. It means that OEMs need minimum or no machine redesign to install the new generation of emissions compliant engines. This has cut lead times for manufacturers by up to six months, cutting costs and increasing competitiveness. But it’s out in the field where OEMs and operators will really see and experience the benefits of these engines. With big increases in power and torque across the board, improved transient response and reduced fuel consumption, OEM machines are set to become more productive, more dependable and more fuel efficient than ever before. Even with the addition of aftertreatment systems there will be no impact on the duty cycle of machines. By choosing the appropriate aftertreatment technologies for each engine, regeneration can take place without operator intervention. In fact the operator will probably not even notice when it’s taking place. The great news is that this boost in productivity doesn’t come at a higher cost of ownership. With many service-saving features such as hydraulic tappets and multi-vee belts and single side access these engines promise a lifetime of low cost. So with the emphasis very much on uptime and greater productivity for machines, Perkins’ new generation of engines offer a seamless solution right up to 225kW (300 hp). Flexible, easy to integrate, productive and cost effective to operate and maintain, these are all attributes that OEMs and machine operators will clearly like the sound of.